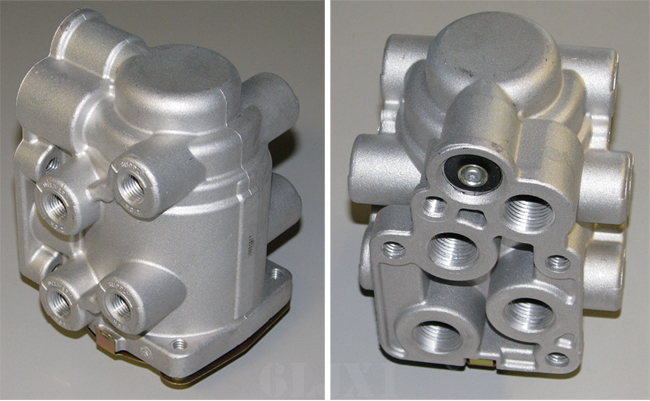 Air brake E-7 treadle valve assembly for all M939 series trucks (with or without ABS). P/N 288383. Replaces 5009254, 286775. Also replaces Mack 20-QE-4216, Freightliner BW 288383, Midland 288383X. The 288383 is a firewall mounted, foot operated dual brake valve with two separate supply and delivery circuits for service and emergency braking. The primary portion of the valve is mechanically operated by the pedal, and the secondary portion of the valve is pneumatically actuated by primary circuit delivered air pressure acting on a relay piston. If loss of primary air supply occurs, extended treadle travel and mechanical force will actuate the secondary portion brake valve. The primary circuit of the brake valve is supplied by #1 Reservoir, and the secondary circuit is supplied by #2 Reservoir. All port functions are marked on the valve.